HELL'S KITCHEN — First, there was the Starship Enterprise. Now, there's the Gray Line double-decker bus. 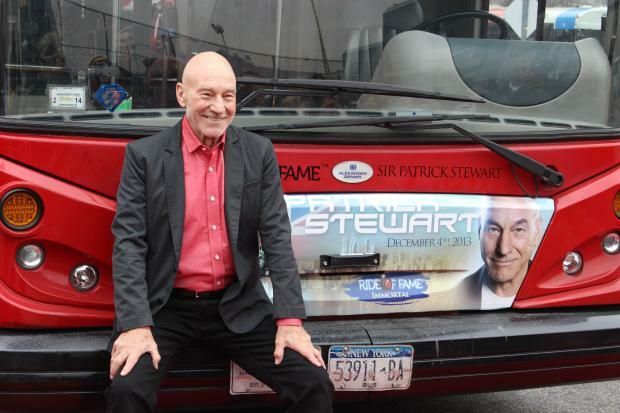 Sir Patrick Stewart, the actor famous for his film roles in "Star Trek: The Next Generation" and "X-Men," unveiled a new double-decker tour bus emblazoned with his smiling face on Wednesday. Gray Line's "Ride of Fame" tour bus celebrates Stewart's two current roles on Broadway — the 73-year-old actor appears in "Waiting for Godot" and "No Man's Land" at the Court Theatre with his "X-Men" co-star and fellow knight, Ian McKellen. "This is an extraordinary honor for me," said Stewart, who lives in Park Slope. "If I had fantasized that one day a double-decker bus in New York would have my name on it, it would have seemed like madness." Stewart described his love for New York, which began when he had a tiny role in a Broadway production of "A Midsummer Night's Dream" in the 1960s. "Of course, 41st Street, 42nd Street, Times Square was a very different place in 1969," he said. "But nevertheless, New York, Manhattan and Broadway got into my bloodstream. The actor has made waves in the theater world for his Broadway performances, but also among everyday New Yorkers, who have delighted in spotting him out and about around the city since he moved to Park Slope last year. "This has been my theatrical second home now for decades. But just 15 months ago, it became my home," he said. "Not Manhattan, where I always imagined I would live, but Brooklyn — because you can see I'm a very cool guy and where else would I live but the coolest part of Brooklyn?" The bus will now shuttle tourists around the city — with a special spot on the upper level with a personalized message for fans. But Stewart, who played a starship captain for years for the "Star Trek" franchise, wanted to get behind the wheel himself. "What do I have to do to get to drive it?" he asked Gray Line staff. "Because you know, I am a motorhead."